We had a sudden, drenching rain storm. Beauty required a lens change. Pat… dang… I really NEED to get that camera… you make me lustful for one. You and my Dr. Friend in scotland… Sanityfound… and Ammonyte. Have you seen his beautiful stuff? He’s actually a R/L friend of ours from England. For Christmas he went to My husband’s favorite country pub and took magnificent photos and did them in a dreamy look… they are absolutely stunning. I had them blown up and framed as my husband’s gift. Awww…niece Alice, mother of two spidermans, I love when you visit Pappy! Hope your trip tomorrow goes smoothly! Amber girl, you wouldn’t want to drive with me though! Does this friend of yours have website so I could look at this work? I can’t draw to save my life either! Very nice, I love it. You’ve got a good eye. This is my Sally Field moment Razz. You love it? Really? You really love it? PS. New camera’s full sensor, good glass, an eye and mother nature? My heavens look at that! Click. He has really been encouraging me to get this camera for my bday :) He has a great eye! See I see this one in a frameless frame just on the wall, it is so refreshing to look at that I have sat staring for the last half an hour (please don’t tell anyone). So much to say and see within that I shall refrain. It is a wonderful image, I can’t shake the teddy bear effect. Woops I meant FIRE extinguisher, not car extinguisher, although it might be wise to carry both. Can someone please tell me how to answer comments individually? I’ve seen other wordpress people do it but I’m not sure this template allows me to do it. Ok. Epicurienne, tanning spud is on its way to England today! Thanks, amber, for website. You are right. Quite an eye! Sanity, funny you should comment like this. I am deciding whether to have this image blown up very large (36 X30) and stretched on canvas to hang in dining room. I have one large wall there that’s painted red. (One other side is kitchen, the other is sliding glass door to porch) and it is open on opposite end to the living room, which is also painted red. I tire easily of what I hang there so every six months or so, something new goes up. Summer Storm may be next. Tipota..We had five inches of rain in two hours yesterday! So, being grateful to be inside was exactly how people felt. Go into your dashboard and then to comments and then edit your comments. In the name of good taste don’t strech the image onto canvas. Tacky, tacky, tacky! Oh, I am laughing now! In the name of good taste!! Tacky, tacky, tacky!! Really? Are we talking about the same thing? Printed directly onto canvas and gallery wrapped? If so, this tackiness costs a lot of money! If we are, then, if and when you come to Massachusetts, we are definitely going OUT to dinner! Oh, you are a pip, as my favortie aunt used to say. Thanks for the comment advice. HOpe this works!! Ok, I don’t think I like this individual comment thing, because it all looks the same. Maybe I can change the font? And, maybe that makes it all too much hassle! Anyway, Razz, serious now. My goal is to have a photo without glass. No visible frame. I am not a carpenter. I’ve seen some gorgeous custom made things at museums. Photo just hangs there without any visible edges, like one of those swimming pools? What are they called? Anyway, Regular photo prints exposed to light without UV Glare glass fade, right? What are some options? oh how beautiful! i love this image. we had rain here too…so nourishing and good for all the green things. you certainly have much talent. you make me want to get out into the world and capture some moments in time. 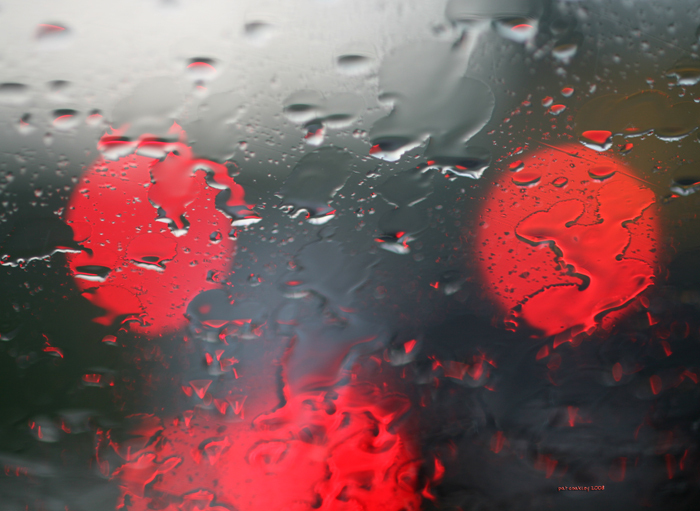 Your hand is as quick and as good as your eye to capture this while driving in the deluge. See, what you’ve done here, is personally boost camera sales internationally, mine arrived today, battery charging now, disc download to follow, and the aspiration to never leave home without it, and be inspired by your prolific artistry. I see you’ve had this effect on others too. Let’s all stand up and tinkle our glasses with forks and cheer you and your blog. Meander, if you could get a driver it would be alot safer! Thanks, sweet pea! Thanks for posting spud to me, Pat. I can’t wait to have him on my mantlepiece! Did you mean infinity pools? Like the endless collective that lives in SFAR? Great shot. You have all sorts of mounting options with different finishes that would allow you to display without glass. Gatorfoam, masonite, artboard, fotoflat, even print on aluminum, stainless steel or plexi. As far as individual answers, you can bold or italicize your replies to differentiate them. The only problem is that people are not able to track your answers on the My Comments feature, because the comment has been edited ands does not count as a new one. Yes, Bl, I do mean “infinity” pools! Those things fascinate me! Nathaliewithanh, I’ll have to check out these other options. Nice to know. Thanks for info on comments. I’ve seen some beautiful linen-based art papers that might be worthy of that image. I think canvas would reduce some of the detail but the linen papers might do the trick. Very nice, by the way.